A good coat is an essential for back to school and Trespass have an excellent selection for every age group.Here is a quick sample and there are loads more in store. If it’s a wet and windy day but she’s heading off to school, the Tomboy girls’ waterproof jacket will keep her dry and comfortable while she’s outside. Designed with a Tres-Shield layer, the material is waterproof up to 3,000mm and has taped seams to protect the stitching. 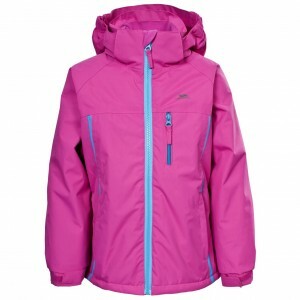 The jacket is also windproof and has a layer of light padding that insulates heat to keep her warm. Fleece lined for extra heat insulation and comfort, the jacket has a concealed hood in the collar, adjustable cuffs and several pockets for easy storage. Available in pink, blue or black styles, the jacket is perfect for a walk on a rainy day. Perfect for extra cold winters, the Tuff boys’ casual jacket is a warm choice that will help see them through frigid days outdoors. Designed with a layer of lightweight padding that will insulate his body heat, the jacket will stay nice and warm and the padding also gives the jacket its attractive quilted finish. Designed with three low profile zipped pockets for storage, a full length zip allows an easy wear while the elasticated cuffs and adjustable hem help keep the cold air locked out. 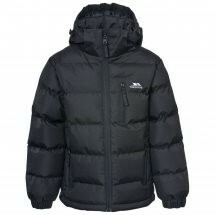 Available in black, blue or grey styles, this jacket will help see him through the cold in comfort and style.